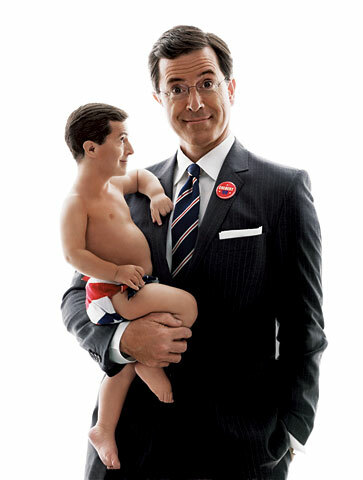 Do you have a lil' Colbert in you? "Cynicism masquerades as wisdom, but it is the farthest thing from it. Because cynics don't learn anything. Because cynicism is a self-imposed blindness, a rejection of the world because we are afraid it will hurt us or disappoint us." Stephen Colbert does not believe in books. They're all fact and no heart. (You may think he wrote one, but it's just a transcription of what he hollered into a tape recorder. Over a three-day weekend, no less) A staunch supporter of George W. Bush and devoted admirer of Bill O'Reilly, Colbert lambasts the liberal elite four nights a week on The Colbert Report. Okay, Stephen Colbert is actually a satirist, best known for lampooning bull-headed conservatives as host of the Report after years of being a popular correspondent for The Daily Show. There are many similarities between Stephen Colbert the man and "Stephen Colbert" the character, but there is a stark difference in that the character is, in Colbert's own words, "a well-intentioned, poorly informed, high-status idiot." His performance was an internet sensation, and the audio recording became the #1 album on iTunes, remaining a top download for months. New York Times columnist Frank Rich called Colbert's performance a defining moment leading up to the 2006 midterm elections, when the Democrats became the majority party in Congress. Colbert himself has said he did not necessarily mean to make a huge political statement, but only intended to be funny (although obviously for a different audience than the dinner coordinators would have liked), and did not realize how strongly his performance resonated until speaking with awed coworkers the next day. On Sept. 24, 2010, having been invited to appear by committee chairwoman Rep. Zoe Lofgren, Colbert testified before Congress, IN CHARACTER, at the House Judiciary Subcommittee Hearing on Immigration and Farm Labor. He did drop character at one point, when asked by Rep. Judy Chu why he felt this issue was important. Not as notably, Colbert co-created and co-starred in Strangers with Candy and did considerable voice acting in Harvey Birdman, Attorney at Law. He was also the voice of Ace in SNL's The Ambiguously Gay Duo. Even less known is his work on the short-lived Dana Carvey Show and the even more obscure sketch show Exit 57. Better known in recent years was his performance as President Stephen Colbert in Monsters Versus Aliens. Colbert came up in comedy through improv at Second City in Chicago (he even guest-starred on two episodes of the US version of the improv show Whose Line Is It Anyway?) while slowly but surely leaving behind his ambitions to be a serious actor. Thank God. Officially One of Us and unashamedly so. When Viggo Mortensen was a guest on The Daily Show, Jon Stewart played a recording of Colbert reciting the many names of Aragorn. (In addition, Mortensen had had a set of chocolates shaped like Lord of the Rings characters sent to Colbert's office, and Stewart's receiving this news was essentially speculating on how powerful a Nerdgasm Colbert would have). When CNN misused an image of the Balrog on 6/6/06, he proceeded to rattle off a list of references to The Silmarillion without even using notes. Colbert also keeps a set of polyhedral dice in his desk at The Colbert Report and is the current keeper of Captain America (comics)'s mighty shield (delivered after Steve Rogers' death) and Anduril (gifted to him by Aragorn himself). Get behind this man on the battlefield. He also won the popular vote in the 2008 election (in the Marvel universe). After being knighted by the Queen of Jordan with Anduril his full name has been expanded to Sir Dr. Stephen T. Colbert D.F.A. And he has recently given "a shout out to all [his] bronies." He is also known for coining the word 'truthiness', as well as the Colbert Bump. Not a bridge in Hungary - although he did win the online contest to decide the name, the Hungarian ambassador to the U.S. appeared on his show, and told him, that in Hungary, bridges can only be named after dead people. As well, a requirement was fluency in Hungarian. Which Colbert met by demonstrating that he knew that "híd" was Hungarian for "bridge." A treadmill (not a toilet) on the International Space Station, the "Combined Operational Load Bearing External Resistance Treadmill" (C.O.L.B.E.R.T.). We believe that that puts NASA in the lead when it comes to insane acronyms, surpassing Aperture Science. The first of Richard Branson's airplanes upon expanding the Virgin brand to Virgin Atlantic as well. Once made an emergency landing due to birdstrike. Geese are On Notice. A Ben & Jerry's ice cream: "Stephen Colbert's Americone Dream." And it is delicious. And it's certainly better than Jimmy Fallon's "Late Night Snack". This page was last edited on 19 November 2018, at 18:32.